Key Difference: Imitation jewellery and artificial jewellery are two words that have the same meaning; they both refer to jewellery made using inexpensive metal and gemstones. 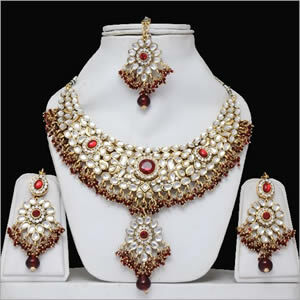 Artificial jewellery comes for a variety of occasions such as traditional wear or everyday wear. The words jewellery or jewelry can usually bring a smile on many people’s faces and if the saying ‘diamonds are a girl’s best friend’ are believed then jewellery is every girl and woman’s dream. Jewellery is not a new invention at all and can be dated back to prehistoric times. Although jewellery is commonly associated with diamonds, pearls, gold and other such precious stones, jewellery is not limited to these. Originally, jewellery included items like beads, shells or plants. Jewellery styles and makes vary depending on culture. Usually ornaments are often long-lived in cultures. Common jewellery that is part of the European culture and known world-wide includes earrings, brooches, rings, necklaces and bracelets. However, other cultures include jewellery such as toe rings, nose rings, hairpins and even genital jewellery. Jewelleries are often used for various reasons including function (such as watches or hairpins), marker of social statues (wedding rings or mangalsutra), affiliation to a certain ethic, social or religious group (cross, tribal beads) amulets for protection and artistic display. While fine jewellery can be dated to prehistoric times, the term costume jewellery has only recently come into use in the early 20th century. Although, imitation jewellery and artificial jewellery are being made by people in local tribes and groups, the official terms imitation, artificial and costume jewellery are only recent. The terms are often substituted for each other because they all refer to the same thing – jewellery made using inexpensive metal and gemstones. Real or fine jewellery is often made of diamonds, gold, ruby, jade, and other such expensive items. However, artificial or imitation jewellery uses, nickel, brass, steel or gold and silver plated steel. 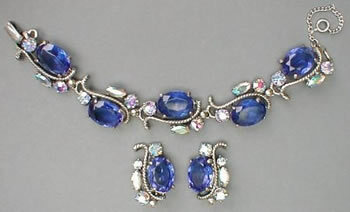 It can also include gemstones such as rhinestone or Lucite. Artificial jewellery is often characterized by the period in history in which it was made, such as Art Deco period (1920s – 1930s), Retro period (1935 – 1950), Art Modern period (1945 – 1960), etc. These days artificial jewellery has become far more popular than real jewellery in terms of usage. Fine or real jewellery is more commonly considered for investment purposes, while artificial jewellery comes for a variety of occasions such as traditional wear or everyday wear. Thanks for sharing, Very Informative blogs.